Overview: Just a word of warning before we get too deep into this review. You may want to take some notes along the way, because this one might get confusing. In this book, we have two Captain Americas; we have two Vipers; we have the first appearance of Phoenix, but it’s not THAT Phoenix that you are thinking about. Likewise, we meet Moonstone for the first time, but it’s not THAT Moonstone that you are thinking about. I’ll do my best to keep things clear, but your best bet might be to pick up a copy of Essential Captain America Vol. 4 and follow along with me. Now, if you were to make a list of Captain America’s most fearsome foes, we probably would put Baron Zemo on that list. The problem there is which Baron Zemo. There’s been at least a dozen Baron Zemos. One dies, and the next crazy Zemo takes on the costume and title and rushes off to face Cap. In this volume, we meet Helmut Zemo, who works under the Phoenix identity. He won’t become Baron Zemo for another 100 issues, but we are more familiar with him as Citizen V in The Thunderbolts. This volume is a slow build up to the Secret Empire storyline. We met the Secret Empire years ago, as an offshoot of Hydra. Remember Hydra – cut off one limb, two more rise up! So it turns out that the Secret Empire has been inserting agents into the highest offices in the United States government. And not just the highest offices, but the oval offices too, if you catch my drift. With the help of the Falcon, members of the Avengers, and the X-Men, Captain America is able to uncover and take down the Secret Empire (for now). Following the battle with the Secret Empire, Steve Rogers finds that he is questioning everything he thought he knew. He finds that he can no longer wear the costume of Captain America, and walks away from the role. Nature abhors a vacuum, and several volunteers step up to assume the mantle of Captain America. The most notable of those was Roscoe Simons, who finds an outfit and tries to partner up with the Falcon. Unfortunately for Roscoe, the pair encounter the Red Skull, who is not happy that his most hated foe is no longer wearing the Captain America uniform. He beats Roscoe senseless, hopefully teaching him a lesson. Meanwhile, Steve Rogers has adopted a new identity in Nomad, the man without a country. Nomad discovers the beaten Roscoe Simons, and realizes he still has a responsibility. He can represent the American people and the American spirit, even if he does not always represent the American government. Steve Rogers returns to the Captain America identity, and the hunt is on to track down the Red Skull. What makes this Essential? : This is an intriguing collection. While I personally do not care for many of the stories here, I recognize that they are important to the history of the Marvel Universe. The Secret Empire/Nomad story came out during the Watergate era in Washington, D.C. Coupled with the Vietnam war, many people were disillusioned with the United States government. It makes complete sense that Steve Rogers would walk away from the uniform and his government. 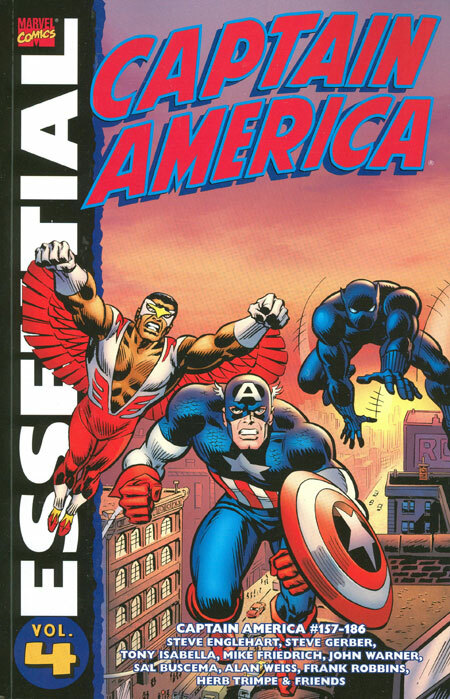 The story appealed to a lot of readers at the time, and Sal Buscema and Steve Englehart have indicated in interviews that this run put Captain America into the top ten books sold during this era. So from a historical perspective, I think this is worth reading. Footnotes: During the Secret Empire story arc, the X-Men were working alongside Cap. During this era, the X-Men comic was reprinting issues from the 1960s. The only way readers could keep up with their favorite mutants was following their adventures in other titles, such as Captain America, Avengers, Marvel Team-Up, and the Incredible Hulk. If you like this volume, try: Avengers Forever by Kurt Busiek, Carlos Pacheco, and Roger Stern. Originally published as a 12-issue mini-series, this is the ultimate Avengers time-travel story. Immortus is targeting Rick Jones, who uses the Destiny Force to bring Avengers from different eras to help him out. One of those Avengers is the disillusioned Captain America that we saw at the end of the Secret Empire story. This Cap is still strong enough to inspire his fellow Avengers, but he doesn’t take over the book. Captain America and the other Avengers (current day Wasp and Giant Man; a Hawkeye from right after the Kree-Skrull war; Yellowjacket post-breakdown but pre-marriage to Jan; a future Captain Marvel; and an alternate universe Songbird) go toe-to-toe with Immortus across time and space. This is an epic story that only a master storyteller like Busiek could have pulled off. This story initially came out 15 years ago, but I still pull it off of the shelf every couple of years to re-read and marvel (pun intended) at how well done this book is. You can find this in both trade paperback and hardcover, as it has stayed in print over the years. This entry was posted in Captain America, Marvel Essentials and tagged Alan Weiss, Captain America, Frank Robbins, Herb Trimpe, John Warner, Mike Friedrich, Sal Buscema, Steve Englehart, Steve Gerber, Tony Isabella. Bookmark the permalink.